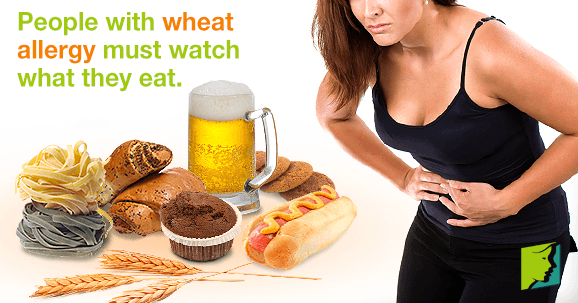 A wheat allergy means a person reacts badly after consuming foods containing wheat or its derivatives. Wheat is one of the top eight food allergens in the U.S. Most of the time, the allergic reaction only occurs after eating wheat, but can also occur after simply inhaling wheat flour. Read on to find out more about wheat allergy, including its causes, symptoms, and how to avoid it. What Is a Wheat Allergy? A wheat allergy is a very common allergy that mostly affects children but can affect adults, too. It is not guaranteed to be lifelong; in fact, many children have outgrown the allergy by adulthood. People with wheat allergy often develop symptoms within a few minutes after eating a wheat product, and sources of wheat can often be quite unexpected; for example, both beer and ketchup contain it. Symptoms can range from mild to severe, and can even be fatal if the person does not get medical attention quickly enough. Because of the similarity in symptoms, a wheat allergy can often be confused with celiac disease. However, there is a fundamental difference; a wheat allergy means the person's body produces antibodies to attack the wheat, but suffering from celiac disease means that the gluten found in wheat triggers the immune system to attack the lining of the stomach. How Do I Deal with a Wheat Allergy? In order to avoid wheat but still eat foods you love, it is possible to buy some foods made with rye or barley instead. Wheat allergy is very common, but unfortunately, the food is such a staple in the modern diet that it is difficult to avoid. People with a wheat allergy must take a little more time and effort to check which foods are likely to cause their allergies and then find alternatives. Understanding menopausal allergies is the first step to lessening their ever-present impact on your life. Read all about allergies during menopause here. Women can occasionally experience worsening seasonal allergies during menopause and as they age. Nasal allergies can be caused by a variety of triggers, such as dust, pet dander, pollen, or even some foods.Nasal allergy symptoms can occur for a number of reasons, and they can be very unpleasant.This article discusses the most common nasal allergy symptoms.